Babies, toddlers and young children are particularly good at getting into things that they shouldn’t. The deployment of proper safety gear can help prevent accidents and keep kids safe at home. As soon as your baby can crawl, you should start building up defenses. Babies usually start moving around into danger zones around the 6 or 7 month mark. Parents should begin with simple items, like outlet covers, a baby gate and cabinet locks. Let us stress that you don’t need to spend a fortune or completely alter the look and feel of your home. Consider your living space, and where you spend time with your young child. If it’s mostly contained to the nursery and a living room, you can really start with just those areas. It’s not until your child is walking (or even crawling at a fast pace) that you have to start worrying about baby-proofing your entire home. Think of it like the world’s most boring (and expensive) tower defense game. Here’s an easy trick: get on your knees and look around. The world is a lot different from a height of 30 inches. Observe where things stack up, what sort of things are just begging to be pulled down by an errant corner, and catalog (and probably just remove) any simple hazards. Beyond the basics, what you want isn’t much different than what you’re looking for in any other baby product: you want it to be simple, inexpensive, and reliable. 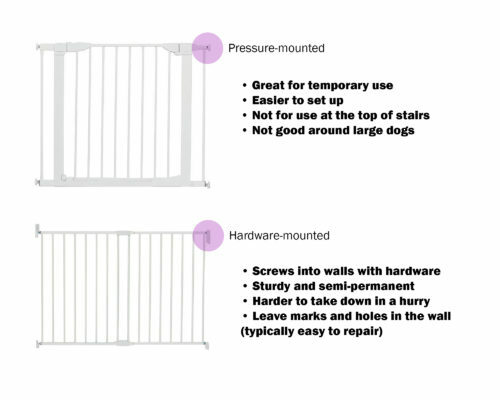 Which gate makes sense for your home really depends on where you are physically installing the gate. For homes with access to stairs, you’ll need one that is rated to be used at the top or bottom of the stairs. Generally, anything that goes at the top of the stairs needs to be hardware mounted. If you have a banister, or something else that isn’t parallel with the wall on the other side of the staircase, you’ll have to look for specialized products that wrap around them. Pressure-mounted gates work well for same-level doorways or the gap between walls between rooms. There are some extra-wide gates that can span a distance of six feet. Many gates are made of metal or wood, and there’s no practical advantage to either. (Wood is plenty strong against a marauding baby.) However, if you have pets too, especially large dogs, you may want to stick to metal, because of its scratch resistance and generally sturdier build. Outlet covers are the simplest part of any baby-proofing equation. Outlets are pretty standardized and the covers are easy to find. We tested several options for ease-of-use as well as looks, and made sure that toddlers were unable to pull them off, too. Given that there are many styles and variations on drawers, appliances and cabinets, we recommended two different styles of locks. There are some other key items that we tested and want to highlight. These include spout covers, toilet seat locks, edge protectors and anti-tip devices. With these items, simply put, you want products that are easy to apply and remove, that also provide the proper cushion and support needed. These are especially important if you have a fireplace, large tables, or sharp edges. We assembled the best of the best, and put them to the test with a room-full of babies and toddlers. We observed how well the products stood up to their abuse, and also polled parents on how well they felt the products worked, and their installation and uninstallation. We wanted to find products that not only did their job, but that also left the home relatively unscathed afterwards. Without futher ado, our picks for the best safety gear. For about 3 bucks a pop, these sliding outlet covers work extremely well. When you go to unplug something, the outlet cover slides back over top of the exposed outlet. The sliding cover has some resistance, which is good, and it helps that they are generally hard for anyone to open, child or adult. The more popular covers from brands like Safety1st were generally more rigid, and harder to open. On more than one occasion we ended up breaking the sliding portion of the covers off, rendering them useless. 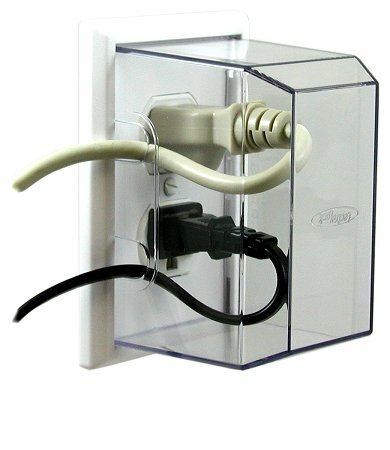 These plug covers have a two-touch release system that again, can be confounding at times, but very effective. We stress that the goal here is safety for your child. These are durable, reliable and 50 cents each. The pack of 32 should be enough for you–that’s 16 separate outlets. Keep in mind that most of the time, you’ll opt for the sliding outlet covers anyways. Plug covers are used in places where you generally don’t have anything plugged into either outlet at all. These are fancier than the traditional translucent plastic ones, but they’re also easier for a parent to remove. Concerned that they’re too easy for a child to remove? The dual action of pressing the sides and pulling the cover out of the socket is too complicated for any toddler we met. When the alternatives don’t meet your needs, this outlet cover is a winner. 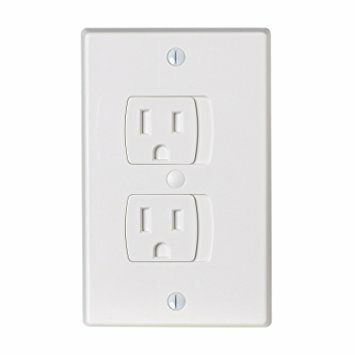 This is the least popular outlet cover design style of the three that we’ve covered, but it works well when access isn’t as important. Other brands had a more complicated install, wherein you removed the existing cover, or they simply didn’t fit larger plugs. Typically parents reach for other styles of covers prior to this one. There are usually better options for today’s parents, who may be plugging and unplugging things often. Also, stationary items such as televisions or lamps are behind couches or other furniture, so there may not be a need for a cover. The Easy-Close Gate opens both ways, and closes with a light push. It will fit doorways that are between 28 and 38 inches wide, using a pressure-mounted design. The gate is made of steel and is about 29 inches tall. There is a small lip that you need to step over, but none of our testers were tripped-up by this. 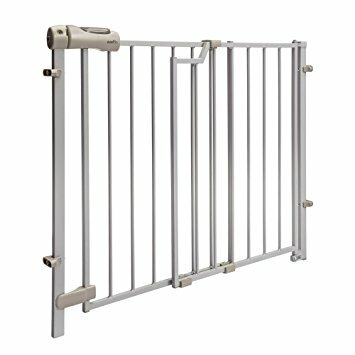 A lot gates that we tested ran in the $80-$150 price range. Our pick retails for $50, and comes with everything that you need in the box. Many other products require extensions or additional hardware, which adds to the price. A lot of reviewers liked the Regalo or Evenflo models. Our complaints? There are many. The Regalo has an awkward opening system that our testers never quite mastered. The plastic used on the handle felt as if it would break easily too. The Evenflo Position and Lock gate is a pretty standard piece of gear at this point. It’s been around for over a decade, but in that time, it really hasn’t changed. If you want to move between rooms you need to unlock the gate and reattach it, or you could try to step over it, but it’s 32 inches tall. The other issue that we feel is important to bring up is durability. Many times we would install these gates, more specifically the Regalo, and it was never straight or sturdy. A small nudge or a decent size dog could push it over. First, this can scrape up your walls and floors, but it also lets the enemy, I mean your toddler, into the room. 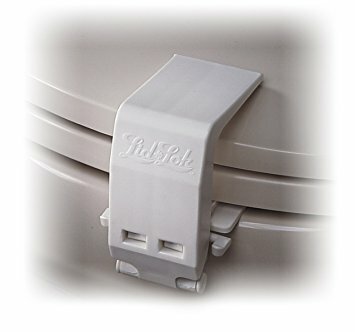 For multi-level houses, this is the most important piece of gear that you’ll need. This gate is $45, and it’s the simplest to use. You can open the gate with one hand, and once the gate is opened, there is no lip or threshold to speak of. The gate opens up and an indicator turns red, to show that it’s not locked anymore. Depending on your stairs, you can set the gate up to open in either direction, and importantly, you can prevent it from opening over the stairs. When you close the gate, a green indicator pops up, so that you can be confident that you closed it. We were impressed with the construction, which in photos doesn’t look as sturdy as it is in-person. 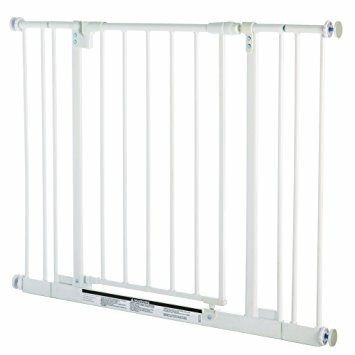 The website Baby Gate Guru had similar things to say, citing the metal frame and simple operation as positive attributes. Overall, it’s effective and highly recommended with over eighty percent of reviews giving it a 4 or 5 star rating. For this category we tried 4 different gates, and found that the most important feature was the installation. Given how the hardware works, on occasion we found that we couldn’t tighten a gate effectively with the hardware provided. One reason was the design. Often times, there is not a very large gap to put a drill or screwdriver in. This means that you have to be pretty careful, or else you end up with multiple holes, a lopsided gate, or screws that go into the wall at odd angles. Any of those aren’t ideal, and can be potentially dangerous. The model that parents were most familiar with was the Regalo Expandable Top of the Stairs Gate. Right off the bat, we had problems with it. To close the gate, you have to pay extra close attention to the housing of the door, lining up the top and bottom. Who has time for that? The metal on the gate was noticeably thinner too, which didn’t affect how well it worked, but for the same price, our pick has much thicker metal bars, lending a secure look to the already secure installation. This one’s pretty straightforward. To prevent your child (or pet) from drinking from the toilet and to prevent a child from placing items that could clog it, use this lock. It’s not perfect, but it is the highest rated item in its category, and it’s inexpensive, at around $7. Teaching your child not to play in/around the toilet is also a well-known strategy. Bathing a kid can be hard. Eliminating hazards can be even harder. A good first step? Put this spout cover on, using the adjustable sizing grid on the interior of the cover. It’s simple to install, and is made of durable rubber. 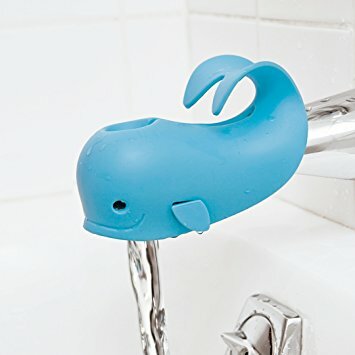 It protects your child’s head, the faucet and again, it’s fairly inexpensive. It can be easily removed when it needs to be cleaned, but surprisingly, it holds up well over time. There are more expensive products that tell your temperature, or bath duration, but we don’t feel that those are must-have features. The Safety Baby locks are highly regarded with 92% of their 3,000+ reviews being 4 or 5 stars. The system is the easiest and most reliable one that we found, and while it’s more expensive (4 locks and 1 key for $14 at the time of writing) it’s simple to use. If you’re a renter and can’t drill into your cabinets, or if you just don’t want to drill into your cabinets, this works like a charm. Apply the adhesive inside the door and close. Our testers found that the adhesive strips (manufactured by 3M) were easy, mess-free and sturdy. These click into place, and don’t provide that gap that many systems do, meaning that your toddler can’t open the doors slightly, which ultimately encourages them to try harder to open the door. 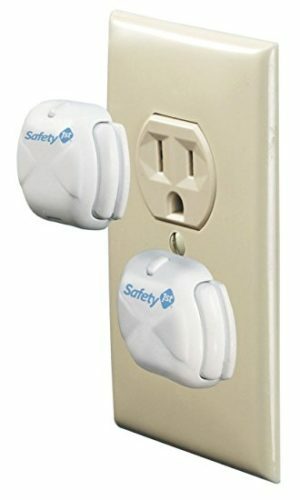 Other products made by Safety1st, SecureHome, and KisCords are popular picks too, but that doesn’t mean that they work for everyone. 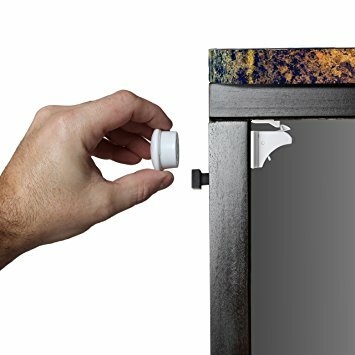 The Safety1st Magnetic Cabinet Locks were harder to install, and generally left a small gap. Like we said earlier, this means that there’s a bit of give in the lock, which can make it easier to break them. SecureHome manufacturers the ubiquitous ratcheting style cabinet locks. Not only does this block entry to one cabinet, it blocks two. This is pretty inconvenient. We don’t like that the child can still pull at, and ever so slightly open cabinets with these attached. The KisCords system has a similar look to that of the strings that tighten and loosen your favorite hooded sweatshirt. Designed as an inexpensive solution for locking cabinets, they’re not super helpful either. Again, they block off two cabinets instead of one, and we found them to be easy enough for older toddlers to play with. Giving them that confidence that they can in fact open something only adds to their resolve. Our pick is simple,and it doesn’t block multiple doors like the competition does. For items like microwaves, fridges, toilet seats, trash cans, and anything else with a door. The latches detach with a two-button pinching motion, which most toddlers haven’t yet mastered. This works great on things with lids, doors or simply to keep unused cabinets or office drawers closed. We liked that the buttons were black, and that the base was white. A typical situation where this is useful is when you’re trying to open the microwave, or the fridge in the middle of the night for a feeding. Whether it’s for yourself or for the baby, having that contrast helps you find the buttons. 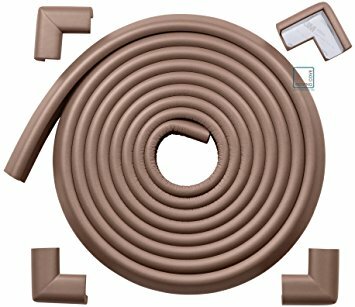 These packs cover 15 feet at a time with an additional set of 4 corner pieces. They use 3M brand tapes, so they remove easily and install with ease. They aren’t the prettiest thing, but they work well. Importantly, they’ve eliminated the standard BPA and phthalates from their foams, but took it a step further in eliminating heavy metals, latex, and SCCPs (a chemical flame retardant). We were able to install these quickly when we had a friend with kids coming over, and take them off without any residue or cleanup necessary. If you just need corner guards, they do that too! Much of what is on the market looks the same, but we liked the inclusion of 3M brand adhesives, which have a strong reputation, and that the manufacturer eliminated a lot of potentially harmful materials from their product. A lot of parents like the simple look of clear corner guards. While these do eliminate the perhaps unsightly look, we felt that they were both difficult to use and that they easily could fall off. Many of them are quite small, such as the ones made by CleverLove, which on the surface don’t look to be that effective in the first place. If those were to fall off they would be clear and thus hard to see, creating a potential choking hazard. Other corner guards, such as the Hamptons Baby Caring Corners were larger than those made by other brands, but similarly hard to securely install. Plus, to remove, you need to take a warm, wet cloth and let it sit on top of the guard until it comes off. Do it too quickly, and you’ll alter your table’s finish. While we appreciate the thought, and the desire to eliminate the effect of babyproofing on your design, we feel that these guards fall short of their goal. Stick to the basics. 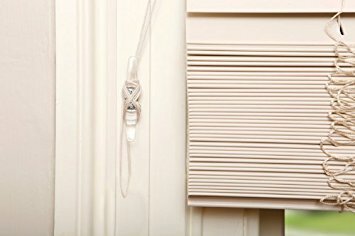 Unsecured cords from blinds can easily become a strangulation hazard. These cleats are translucent, so they can be installed without altering the look and feel of your blinds. The cord wraps in a figure-eight, so that no cords are left dangling. There’s not much else to say, other than they’re simple. It takes 60 seconds to screw one of these in (or less with a drill) and they eliminate a hazard. No need for anything fancier here. We tested inexpensive brackets and found that the thin plastic was hard to work with and install without breaking them. We prefer straps that are fabric or leather. Our pick has fabric straps with secure triple-stitching, and a metal connection. They’re incredibly secure, and work for tables, dressers, TVs etc. 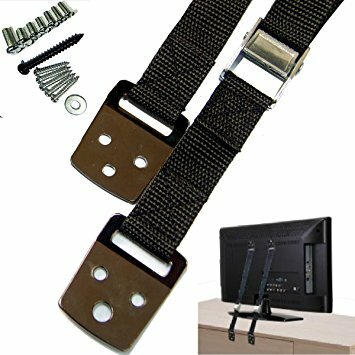 Depending on the item, we also like the Safety1st Furniture Straps. They’re made of durable canvas, which we prefer over plastics, and they were easy to install. These work well for smaller items, or to reinforce an item that is already somewhat secure, like a hutch or the top of an armoire. The plastic anti-tip devices found in most nursery pieces are fine, and will do the job. That said, they’re not easy to install. They’re essentially cheap cable ties that lack any sort of mechanism to adjust once their attached, meaning if you don’t do it right the first time, you’re out of luck. With fabric and hardware that is generally made of metal, you’re able to use these more than once, and it different places, based on how your furniture is designed. 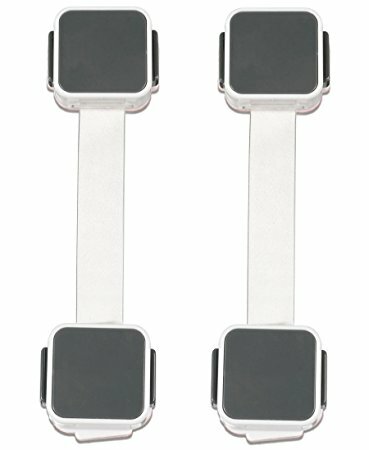 There may not be an obvious position for which to place a bracket or to attach it to a wall. Having a little more flexibility in position is beneficial. WonderKid’s system is flexible in how it can be installed. Whether it was a TV or a dresser, there seemed to always be a way to secure the piece, without doing irreparable harm to it or compromising on the installation. As your child grows, so do the challenges of baby-proofing. When they’re small, you can put them into a play yard, eliminating most hazards in your home. Once they’re crawling though, it’s a whole new ball game. Remember, defense wins championships, and staying one step ahead of your toddler is the best defense. You may want to consider adding rugs (and a rug pad) and replacing some of your wooden coffee tables with poufs or a tufted ottoman. The transition is just that, a transition. So long as you’re watching your child, while also eliminating hazards, you’ll do fine-and eventually they’ll stop putting everything in their mouth. Our team has spent months putting this guide together, in an effort to make baby-proofing a breeze. Sure, we won’t be there to peel and stick, but we’ve made sure that the products we recommend are easy to use, install, and uninstall.